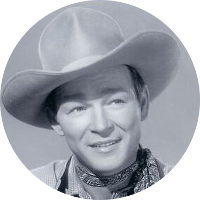 Roy Rogers was an American television and movie actor, and singing cowboy. He appeared in over 100 films and starred in The Roy Rogers Show on NBC. He was married to actress, singer and songwriter Dale Evans, who often starred alongside Roy in both television and films. Roy's sidekick in many of his films was his palomino horse named Trigger. Throughout much of the 1940s and into the early 1950s, Roy Rogers was ranked by theater ticket revenues as the most popular Western star. Roy Rogers has a number of U.S. Presidents in his family tree including George Washington, Thomas Jefferson, John Quincy Adams, Zachary Taylor, Calvin Coolidge, William Henry Harrison, Benjamin Harrison, and both Presidents Bush. He also has royal kinship to King Henry VIII, Queen Elizabeth II, and Catherine Middleton. Fellow celebrities in Roy Roger's family tree include Bill Paxton, Matt Damon, Jodie Foster, Amy Grant, Elisabeth Shue, Olivia De Havilland, Katherine Hepburn, and Walt Disney. Some of his famous historical kin include polar explorer Admiral Richard Byrd, mutiny on the Bounty leader Fletcher Christian, explorer Meriwether Lewis, evolutionist Charles Darwin, outlaw Jesse James, and Confederate General Robert E. Lee.